This piece originally appeared on Need Supply. Our friends at Blanchard’s Coffee Roasting Co. sent over a few bottles of their excellent Hair of the Dog cold brew this week. We decided to put it to good use in the studio, so we played mad barista and made up a few distinctive riffs on cold brew that you can easily make and modify yourself. In Italy, the traditional affogato is what you drink when you’re out on a shopping spree or otherwise feeling too saucy for a boring cappuccino or americano. The word affogato literally means “drowned,” and drown in hot espresso is just what good barkeeps across the penninsula do to hapless spoonfuls of gelato to make the iconic drink. For our version, we went full American with an “Already Cold Affogato.” We used way more gelato, too. Vanilla gelato. Try other flavors, too. Pistachio or straciatella work especially well. Keep your gelato in the freezer and your cold brew in the fridge until just before you prepare the drink so both are at maximum coldness. Scoop gelato into glass, filling up to no more than halfway. Pour the cold brew over gelato until just a small bit of the gelato is peeking of the liquid. Garnish and eat with a spoon. Of course, a dash of nutmeg or cinnamon never hurt any drink. Since cold brew is a bit more stiff-legged than other methods, we thought it’d lend itself to a riff on Thai iced coffee—a delicious drink whose flavor is often one-dimensional: sweet. We made it boozy and then added the most polarizing flavor note of all, bitters, to do battle with the sweet overtones. This one works best in exactly the sort of glass we made it in: a heavy-bottomed tumbler, just like a good Negroni. As with any dignified cocktail, start out with good, clear ice. Add a liberal shot of rum and several dashes of bitters. Go light if you aren’t a huge bitters fan, but heavier if you like the taste of chinotto or Campari. Add the chilled cold brew to fill your tumbler to about 3/4. Pour in about a half-shot of sweetened condensed milk slowly. The thick liquid will sink to the bottom, so stir vigorously to mix thoroughly. 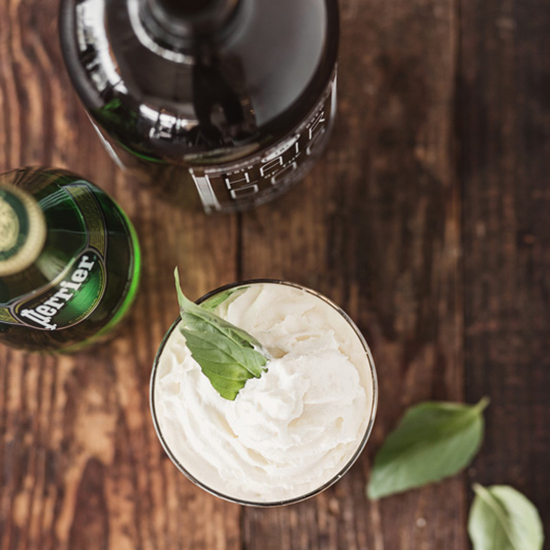 Garnish with a small dab of whipped cream, if desired, and a sprig of Thai basil. We only had conventional basil on hand for our shoot—it works nicely, too—but the punchy licorice notes of Thai basil is ideal. Add a dash of cinnamon up top and drink up. We used basil as a key ingredient in this one, too. It feels highly classy thanks to an unlikely combination of carbonation and coffee—it’s a counterintuitive mix, to be sure, but complex and delicious, and when used as a starting point (coffee + sparkling water) can be a whole new platform for coffee experimentation. Note that we used Perrier because it’s more effervescent than San Pellegrino, but any good unflavored seltzer or mineral water (not club soda or tonic) will do. Also, if you’re not using block ice, a good stemmed glass would add to this drink’s elegance. We didn’t happen to have anything for muddling lying around the studio, so we made use of the ice block itself to smash the full flavor out of the fresh basil and ginger. An ice block is best because it has less surface area, and thus melts more slowly, than conventional ice. After your herbs are pressed for maximum flavor, pour chilled cold brew over the ice block to about 2/3 to the top of your tumbler. Add your sparkling water to about 1/2 inch from the glass’ rim, and then top generously with whipped cream. The cream will progressively sweeten the drink as you enjoy it. We imagine this might be pretty tasty with mint instead of ginger, or even with a splash of lavender syrup.